Audio Converter for Mac is a professional Mac audio converter which provides a simple and fast method to convert between most known audio files: MP3, MKA, WAV, M4A, AAC, AC3, AIFF, AMR, FLAC, WMA, MP2 etc. 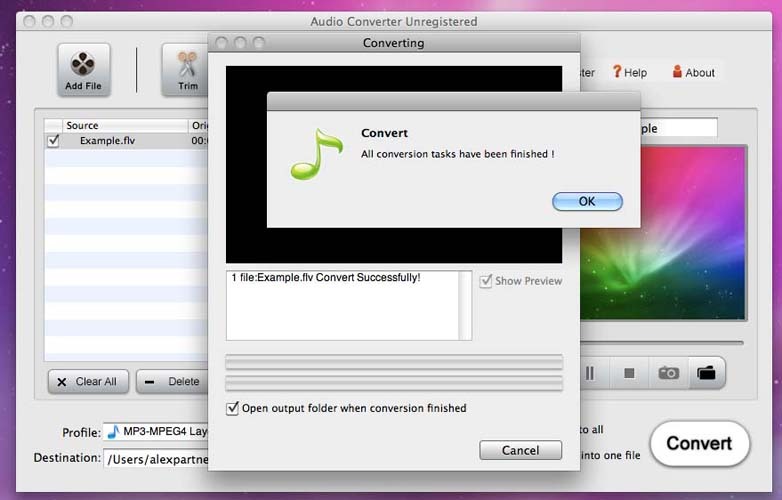 • Convert among audio video file formats on mac os such as MP3, WAV, M4A, AAC, AC3, AIFF, AMR, WMA, MP2 etc. • You can split a full length audio file to get your favorite clip by set Start and End Time or split/trim it to small pieces. You can also merge several audio files into one file. Audio Converter for Mac OS X can read and write files in many different formats. 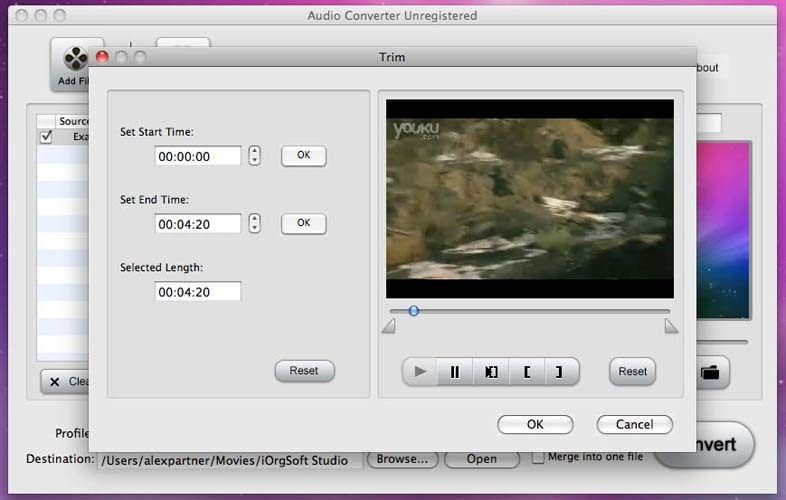 Converting a single file or a whole folder of audio files from one format is straightforward for Mac OS X.
Mac Audio Converter can perfectly extract audio file from MPG, MPEG, MPEG 2, VOB, DAT, MP4, M4V, TS, RM, RMVB, WMV, ASF, MKV, AVI, 3GP, 3G2, FLV, SWF, MPV, MOD, TOD, HD video video files and convert them into MP3, AAC and AC3…audio formats. With Mac Audio Converter, you can split a full length audio file to get your favorite clip by set Start and End Time or split/trim it to small pieces. You can also join several audio files into one file. 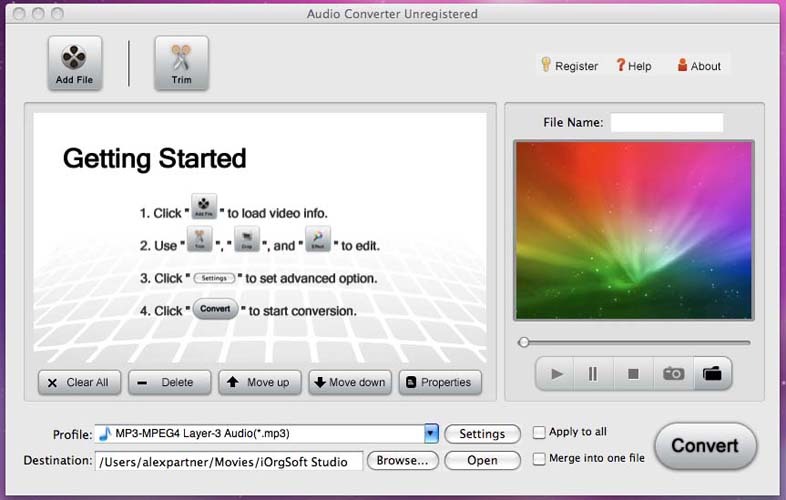 Audio Converter for Mac is easy to install and use with a very handy and clear user interface. 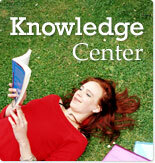 Crop your DVD video to remove black sides and trim your video files to only convert a part of a video file. OS Mac OS X 10.4 or above operating system(include Mac OS X v10.5.7 Leopard and Mac OS X v10.6 Snow Leopard). iPod, iPhone, PSP, Mobile Phones, BlackBerry, Zune, Creative Zen, iRiver and other MP4/MP3 players. How to customize your own music with audio converter for Mac?